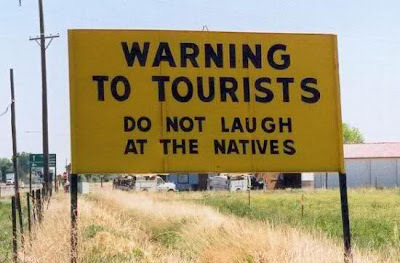 We are here with some of the most hilarious english language errors that will make you laugh. Enjoy the language of these great peoples. All of this is collected from various sources on the internet. 1. An employee applied for leave. "Since I have to go to my village to sell my land along with my wife, please give me one-week leave." 2. A Job application from a non-english speaking country. "This has reference to your advertisement calling for a ' Typist and an Accountant — Male or Female'..... As I am both (?"?" ) for the past several years and I can handle both with good experience, I am applying for the post." 3. Another man's great language power. "Dear Sir: with reference to the above, please refer to my below..."
"Lady's, leave your clothes here and spend the afternoon having a good time." 5. From H.A.L. Administration Dept. "As my mother-in-law has expired and I am only one responsible for it, please grant me 10 days leave." "Women's are requested not to have childrens in bar." 7. An extraordinary leave letter. "I am suffering from fever, please declare one-day holiday." "My wife is suffering from sickness and as I am her only husband at home I may be granted leave". "I am well here and hope you are also in the same well." 10. Most Awesome Covering note. 11. A Restaurant in India. Open seven days a week, And weekends too. Our food leaves you nothing to hope for. 13. Tribute to the Professors. Open the doors of the window. Let the Air Force come in. Shhh...Quiet, boys...the principal just passed away in the corridor. Shhh... quite, the principal is rotating in the school. If you enjoyed the post, please give some time to our efforts and share it.